Probate Real Estate Notice of Proposed Action? When becoming responsible for a loved one’s San Diego probate real estate, you may have heard your San Diego probate attorney talk about a Notice of Proposed Action (NOPA). 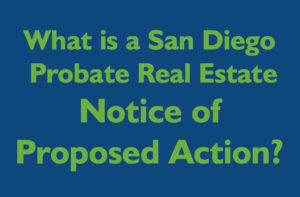 A NOPA must be drafted when dealing with the sale of real property in a San Diego probate. The notice must be in writing, and sent to the interested persons, the heirs or beneficiaries, or anyone or any entity, requesting special notice of the San Diego probate proceeding. The NOPA is a legal document that your San Diego probate attorney will draft when there’s some type of action that’s going to occur, such as the sale of the decedent’s home, and your attorney is notifying, on your behalf, all the beneficiaries. An experienced San Diego probate real estate broker, like me, will work with your attorney by providing the detailed information regarding the proposed sale of the decedent’s home to your San Diego probate attorney. This notice informs the beneficiaries that you, as the executor or administrator, will be taking some type of action that affects the estate, such as the sale of the home. The NOPA, once mailed to all of the beneficiaries, expires after fifteen days. When all the beneficiaries do not object to the proposed action during the time allotted, then you are safe to go forward with the action. As your Certified Probate Real Estate Advisor (CPREA), my team and I will also monitor the timeline to be absolutely certain the NOPA was successfully delivered and expired before completing the sale of the decedent’s home. Another thing to be aware of regarding the NOPA is that there is a method to shorten the timeline from the required fifteen days. You and/or your attorney can ask the beneficiaries to simply check a box that confirms they consent to the action that you’re about to take. Then they will sign and date the NOPA, and return it to your attorney. Most executors and administrators are surprised to learn the length of time to fully complete the average California probate. After we work together to prepare, and market the San Diego probate real estate, they are also sometimes surprised that a NOPA is drafted by the probate attorney and mailed to all the beneficiaries. This is after an offer to purchase the home is negotiated and the San Diego probate real estate begins the “pending a sale”. But, most executors and administrators also appreciate that they are protected because of the NOPA, and if any of the beneficiaries would have an objection to the NOPA, the San Diego probate court would then need to confirm the sale. In the unlikely event that a beneficiary objects to the proposed action within the fifteen day period, then a court order is required to proceed with the action. What this means, to you, is that your San Diego probate attorney would file for a court date with the San Diego probate court. No need to be concerned, because my team and I will negotiate on the estate’s behalf to get the best price and best terms for the home. Experience shows most notices expire within the fifteen day period and we move forward towards the sale of your loved one’s home. Your probate attorney will monitor the deadline and when there are no objections, then the NOPA has been completed. To revisit the mailing of the NOPA, in most cases, that notice is going out to the people, the loved ones, that are connected to the person who has passed away. It’s primarily family members or friends, but occasionally there’s an entity involved. To touch on that a little bit, sometimes the decedent will leave a will, and the will may address an entity as a beneficiary. Experience shows that an entity, some type of a charity similar to the Humane Society or a religious organization, a group that’s close to the decedent’s heart, is named in the decedent’s will. The written will bequeaths a portion of the decedent’s estate to this entity. In addition, the decedent’s beneficiaries do not necessarily have to be family members; friends can be named in a will. With the exception of creditors, a will drafted by the decedent is the only way that someone other than a family member can have some type of claim on any portion of the decedent’s estate. Because the timelines are so important, it is necessary to have an experienced probate attorney assist you. Most San Diego executors and administrators choose to have an experienced probate attorney help direct them, and guide them through all the many steps that need to be taken to properly move through what has to occur in order to successfully complete the probate. Your skilled and experienced probate attorney knows the steps to be taken because that’s something they do on a regular basis, and they will be your legal representative through the entire legal process.